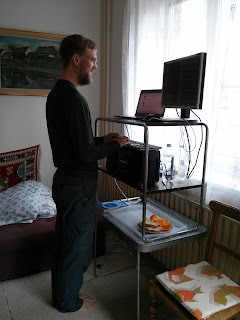 At home, Jon's been using a standing desk for about a year and he really likes it. Now he's working from wherever we're living, so his work set-up will be changing frequently, which we hoped would compensate for whatever uncomfortable situations he found himself in. Here in Prague, while he has a lovely view from a large window in our room, he's been sitting in a less-than-ideal kitchen chair, slouching and slumping and leaning forward and getting increasingly sore and stiff. So today, I conjured up a standing desk for him. Look, he's smiling. But it was too high, so we had to come up with something else: a Saxon Algebra I textbook (we brought it for Lillian to use next year) and a roasting pan, wrapped in a towel to prevent slippage. Ta da! The desk is made up of two tables on top of each other. 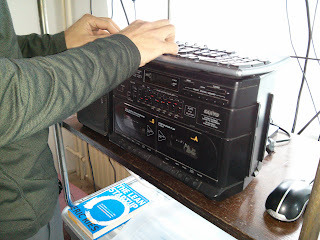 His laptop and monitor (which Jon packed in his suitcase on the trip over) are on the very top. 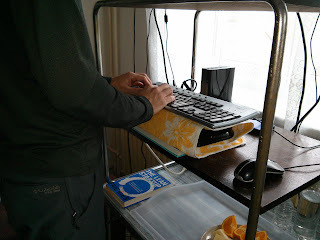 His keyboard, mouse, power strip, and an external hard drive are on a shelf below that (the shelf belongs to the top table). The bottom "shelf", which is the other table, just has some miscellaneous stuff on it, often food and drink. I think he's happy to be standing again, even if it's just for a week until we move to Dresden. I wonder what we'll come up with there.